He'll not only SIT, but STAY! This Hubley "Sitting Scottie" bookend would certainly look great propping up your books, but the three-dimensional, full-figure dog could also be used as a table or mantle accent as well as a doorstop. Made of a bronzed cast iron, the unmarked piece is in excellent vintage condition - with no breaks, cracks, chips or repairs. The patina has mellowed to a rich, even tone; there is no over painting of the collar, eyes and tongue. The casting is excellent - illustrating strong definition to the body, face and hair. There is a casting seam running down the head, back and tail and another running down the right side of the face, chest and right leg. The Catalog #391 "Sitting Scottie" measures 5" high by 3 1/2" wide by 6" deep and weighs close to 4 pounds. 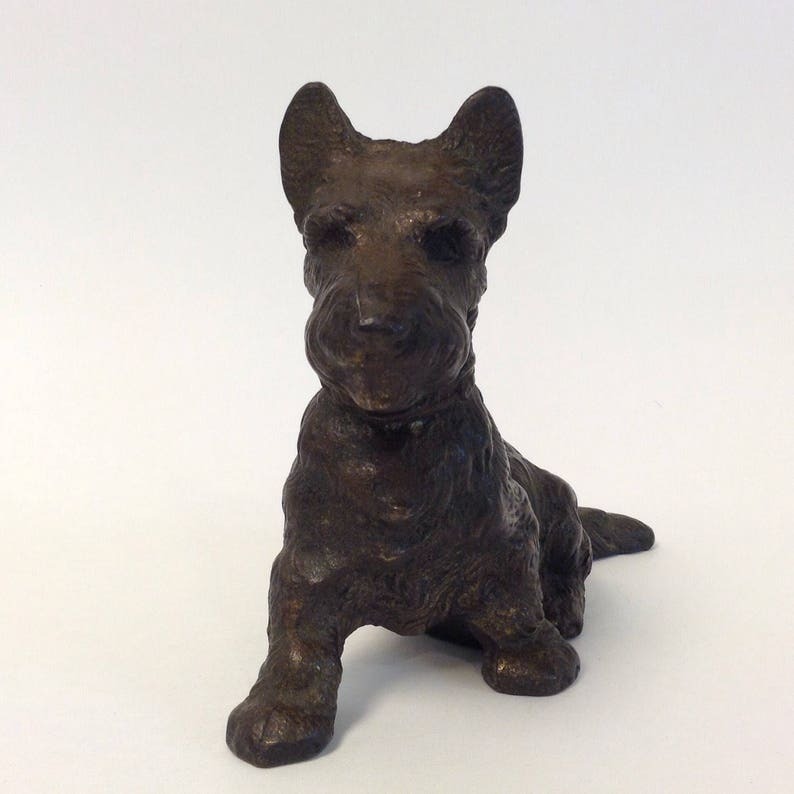 This piece is characterized as a bookend; a larger version of this terrier (Hubley Catalog #412) is considered a doorstop. There is a slight wobble to the figure when placed on a flat surface - easily remedied with a felt dot. If you need a pair, I do have a second, matching dog in comparable condition; however, the orientation is the same as this one - not the reverse. Just convo me for more information. This terrier would make a fabulous addition to a collection, an interesting decorative piece, or a wonderful gift for a Scottie lover.